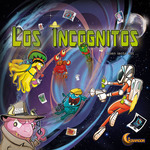 Los Incognitos: Alien iacta est is a dice game in which the players try to track down as many extraterrestrial time travelers as possible. The players roll their dice as long as it is possible to carry out at least one of four possible actions. Except from storing a maximum of two dice, the players can walk or fly through different eras of human history in search of alien visitors. They receive points for monsters they have marked and also for sites they have explored. After a certain number of rounds, the most successful monster tracker as determined by the number of points wins. The mechanisms of Los Incognitos: Alien iacta est are based upon those of Expedition Sumatra: Dadu Dadu, but in addition to the different theme, there are new scenarios on bigger boards with optional rule extensions. The game offers four scenarios varying in complexity, each set in another era of human history. Regala Los Incognitos: Alien iacta est [USATO]!